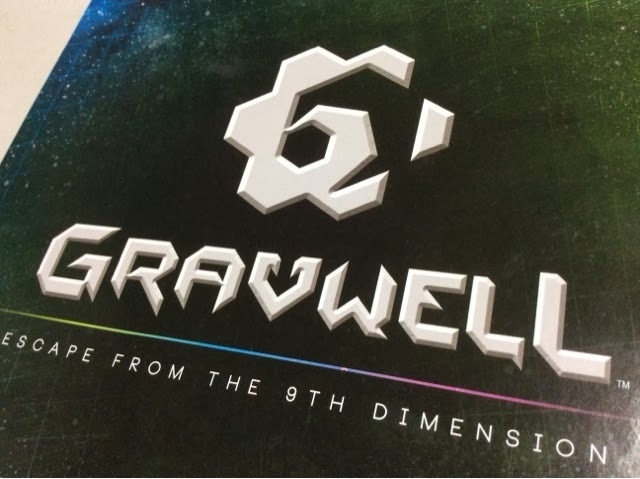 Over the weekend, I managed to get in a play of Cryptozoic's new release - Gravwell: Escape from the 9th Dimension. Its very much a filler game where players are racing to escape from the 9th dimension by cleverly drafting cards and using them in the right sequence to power yourself ahead of the other players. 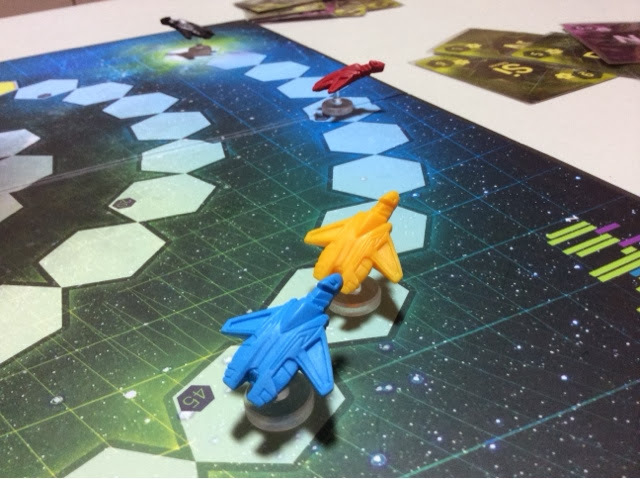 It is a race type game where the player who reaches the end space first is the winner. The gameplay is executed in 2 simple phases - the draft phase and the card play phase. During the draft phase, players take turns to draft pairs of cards on the table till each player has accumulated 6 cards ( 3 pairs of cards ). The cards are laid out on the table in pairs whereby only one of the cards in the pair is visible to all players. The other card in the pair is hidden information. Each card contains 3 important distinctions which will affect its appeal to each player. The second detail is the number. That determines how far the ship will move. Once the draft phase is over, the card play phase will kick in. Simultaneously, each player will play one of their 6 cards facedown. They will reveal it together and carry out the action on the card based on the alphabet represented. Starting from the closest alphabet to A, players will perform their card ability. The cards mostly involve movement of the player's ship a certain number of spaces. The interesting part is whether the movement is towards the goal line or backwards ! 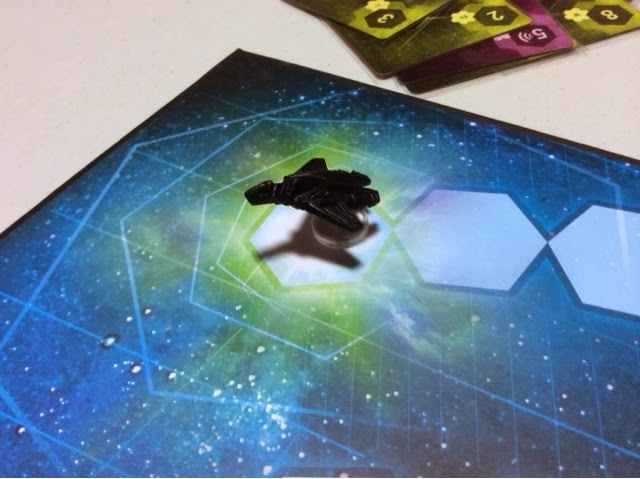 When the player executes his/her card ability, if it is a gravity card, he/she will move in the direction of the next nearest ship ( whether forward or backward ). If it is a repulse card, the player will move in the direction opposite the next nearest ship. And lastly if it is an attraction card, the player will pull all the other ships closer to him/her. This is basically the meat portion of the game where players are trying to time their moves right and outguess their opponents. 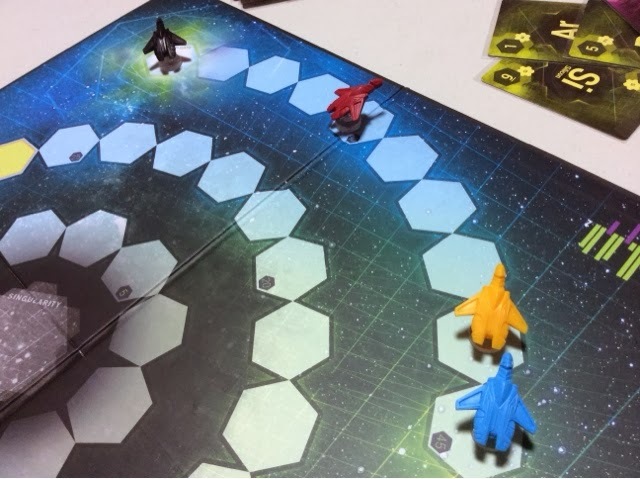 A round consists of 6 turns and once that is over, players will head back to the drafting phase and carry this out again and again till someone reaches the end space or when 6 rounds are over. The player who escapes is the winner, or the player who is closest to the end space after 6 rounds is the winner. ** Once each round, there is an emergency stop card that each player may play. This lets you cancel the ability of your card in case it leads to a very unfavorable movement outcome. I was quite surprised by my first play of Gravwell. I liked how each card has a significant value based on the player's need. The A card lets you take your turn first, but only lets you move 1 space. Whereas the Z card lets you go last but lets you fly a very reasonable distance in exchange. I didn't feel that any card was overpowered or exceedingly important but rather, I felt that the decision on which pair to draft got tougher as the game went on. At the start, the players are mostly bunched together that, with most cards you will probably make a decent amount of movement. But towards the end, you tend to double think what is important to you as the distance from others is further and moving back too much might get you into a spiral that you can never recover from ( at least not in time before the game ends ). So the choices near the end are exceedingly tight and tense and I appreciated that a lot. I also liked the player interaction whereby you want to play a card later than someone else so that he/she is close enough to you to let you propel yourself forward. Its the reading of someone's mind that is fun and how you use that to manipulate the situation to your advantage. A lot of the game relies on positioning and timing which always leads to great player interaction and sometimes much laughter. All in all I think Gravwell hit the sweet spot in terms of big gameplay in a short period of time. The game went by quickly and the gameplay was smooth from start to finish. Easy to pick up and teach to people and very friendly for new gamers. My only concerns are in its replayability and its unnecessarily big box size. I'm not sure that the game has as much legs as most other fillers. I'm not saying that there is a proper way to play it, but I find that the strategy and tactics in the game can be boiled down to just one or two simple theories of movement and you will largely use that for all of the games you play. Also, the game is in a box way too big for what you get. I would buy it in a heartbeat if it were more compact, but now I have to think twice and thrice. The box is only big due to the board and I think using cards for the board ( or having an assemble/jigsaw board ) would have done a lot to shrink its footprint in a game collection ( and increase its portability ). The board is nice don't get me wrong, but the box is just too big for this filler game.